Special Containment Procedures: A library located in ████, Italy, is partly built of blocks of SCP-888 in its 'full' state. The portions of the building constructed of SCP-888 are designated as "rare-book" storage; only three senior librarians have access, and two of these are on the SCP payroll. The third librarian is aware of the room's true purpose, but is a representative of and liason to ███ ███████. A second sample, of 'empty' SCP-888 remains in the vault beneath the library, where it was originally discovered. Access to this vault has been rerouted through the "rare-book" room, and all other passageways to it have been sealed with reinforced concrete. At this time, no additional containment measures are deemed necessary. 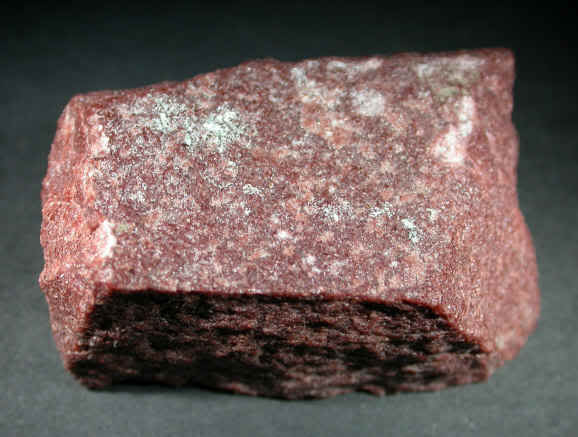 Description: SCP-888 is a mineral composite similar to a rare red quartzite found only in ███████, Russia; however SCP-888 also contains trace amounts of an unidentified organic compound. This stone exhibits the capacity for large-scale data storage within its molecular lattices. SCP-888 exists in two distinct states, hereafter referred to as 'empty' and 'full'. In its 'empty' state, SCP-888 is colored a pale pink, and is slightly translucent. In the 'full' state, the color deepens to a darker red, and the stone becomes completely opaque — see the attached image. It is theorized that these changes result from the realignment of the molecular lattices to contain the stored data. At this time, the source of this stone is undetermined. SCP-888 reacts to the presence of sapient beings, and appears to require direct skin contact to function. If a thinking creature touches an empty sample of SCP-888, the stone removes a memory from the subject, and stores the memory in itself, converting to the 'full' state in the process. The original memory is lost to the subject. One of the early test subjects described the experience as "like losing a tooth — you know there used to be something there but all that's left is a bloody hole." Testing has confirmed that it is possible to loosely direct what memory is excised, by concentrating on a specific memory before touching the stone. If a subject handles a sample of 888 with no specific thought in mind, the memory lost is essentially random, though it may be chosen by the subject's subconscious. If a subject instead touches a 'full' stone, the subject experiences the memory contained within it, firsthand. Subjects report that the experience is completely 'real' to them during replay. As long as the subject remains in contact with the stone, the memory continuously 'loops,' with each subsequent re-play possessing the same emotional impact, as if every repetition were the first time. Contact by the original memory donor does not restore the memory. Instead, subjects experience a dissociative state, in which the memory reportedly feels like "a story someone told me," or "something I dreamed about." Before-and-after MRI scanning seems to indicate that the memory transfer process causes cellular death in the subject's brain. The exact mechanism is unknown at this time, but it is theorized that the transference causes a burst of electrical activity in the cells which originally contained the data, essentially cauterizing minute portions of the brain tissue. Playback causes no analogous damage to brain tissue, however the replayed memories are so vivid that some test subjects have exhibited psychosomatic responses, such as blisters rising on a hand which was burned in the memory. Samples smaller than ~8 cubic centimeters lack the ability to retain data, and are unable to absorb or replay memories. Aside from this 'minimum operational size,' there appears to be no correlation between the size of the sample and the amount of data which can be stored. If a 'full' sample of 888 is reduced by mechanical means into fragments smaller than 8 cubic centimeters, the recorded data is lost when the stone becomes inert. The original host does not regain the lost memory. However, if a 'full' sample of 888 is separated by mechanical means into fragments larger than 8 cubic centimeters, each fragment retains the full mnemonic content of the original sample. Construction of the original building was commissioned in 15██ by Patrizio ████████ of ████, Italy. Records of the construction, such as the source of the stones used and the identity of the architect, were lost in a fire at Villa ████████. Historical accounts claim that the fire was set by Signora ████████, for reasons unknown. The fire claimed the lives of all present in the ████████ manor. It is therefore unclear whether the presence of SCP-888 in the construction was intentional, and if so, what the purpose of its inclusion might have been. The current storage site originally contained roughly 1 cubic meter of 'empty' stone, which was previously housed in a sealed vault of ordinary granite. This cache was discovered by Father ████ ████████, who was cataloging the occupants of the catacombs attached to this library. Fortunately, his initial contact was with a small chip broken off when the vault was unsealed, and the main mass of stone was therefore left untouched. Fr. ████████ contacted █████ ██████, the occult research division of ███ ███████, however once it was determined that SCP is not [REDACTED], █████ ██████ contacted the local SCP liason. Testing consumed approximately one third of this supply before a functional minimum was determined. As of this writing, several fragments of roughly 18 CCs have been separated from the main mass, and are set aside for testing purposes. Because the amount of stone available is sharply limited, all testing must be approved by the head researcher assigned to SCP-888, Dr. █████, or his superiors. Special Note: Research into the content of the 'filled' stones used to construct the library is ongoing. There appears to be a rough chronological order in the layout of the building, with newer stones near the south entrance, proceeding top-to-bottom, south-to-north toward older memories. As more information becomes available, it will be logged in file SCP-888 Archive.